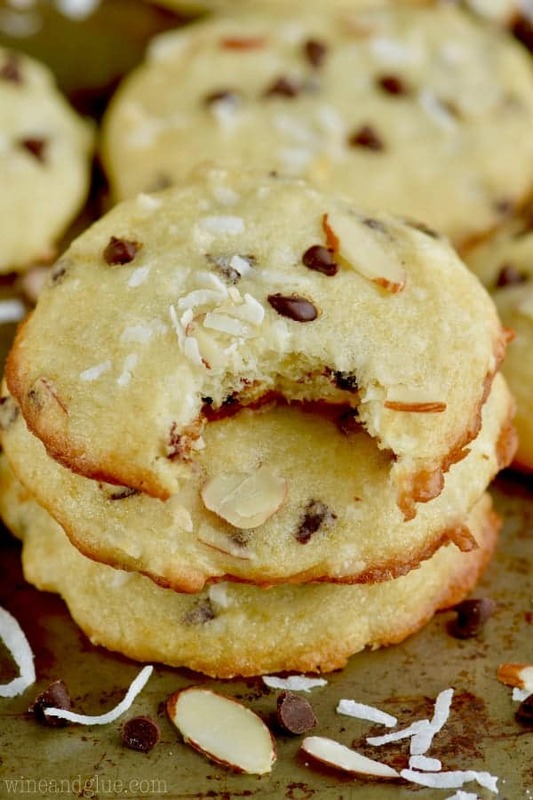 These Chocolate Almond Coconut Yogurt Cookies are chewy, delicious, and the perfect flavor! These cookies are made with vanilla yogurt, but you could use this recipe as just a starting off point. Make it with strawberry yogurt and add only chocolate chips. Or make it with lemon yogurt and add some blueberries. The possibilities are endless. If you want to do more baking with yogurt be sure to check out this three ingredient yogurt bread. I’m so happy to be partnering with Yoplait, especially given their amazing #MomOn campaign! Thank you so much for supporting the brands that make Wine & Glue possible! I have come to the realization in the last week or so that I am not one of those moms who is . . . . friendly. Hahahaha! This realization came to me when we were standing outside of the 7,534th activity we were at for one of my kids last week. I was busy on my laptop working and kind of realized that I was the ONLY mom who wasn’t chatting with the other moms. And there I am with my laptop scheduling Facebook posts for Wine & Glue. You guys. Can you even imagine what the other parents think? They are probably questioning who this crazy anti-social lady is and why she insists on bringing her laptop with her to play on Facebook. One of the reasons that I’m so pumped to be working with Yoplait this year is because they have this incredible #MomOn campaign, basically encouraging moms to be who you are not worry about whether the world is judging you or not. And then I thought – even if I am dragging my laptop around to “play” on Facebook while my kids are doing activities like some weirdo – my kids are doing activities! That’s a win, right? And while we are on the topic of the trillions of activities my kids are in, can we talk for a second about how hungry it makes them? Like stark raving mad hungry, which is why we love all the snack options that Yoplait has to offer. 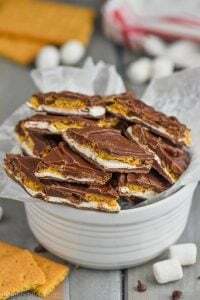 Great snacks that are super easy to grab as we run out the door for taekwando, or swimming or ballet or hip hop or a lecture on quantum physics. Just kidding about that last one. Yoplait has these new Mix-Ins that are totally amazing! They come in a variety of delicious flavors – the Key Lime is probably my favorite – including this Coconut Chocolate Almond! They make a great snack for the kiddos …. if I feel like sharing. 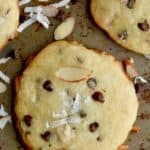 Their Coconut Chocolate Almond Mix-Ins flavor is so awesome that it inspired these amazing cookies! You really can’t beat that flavor combination! 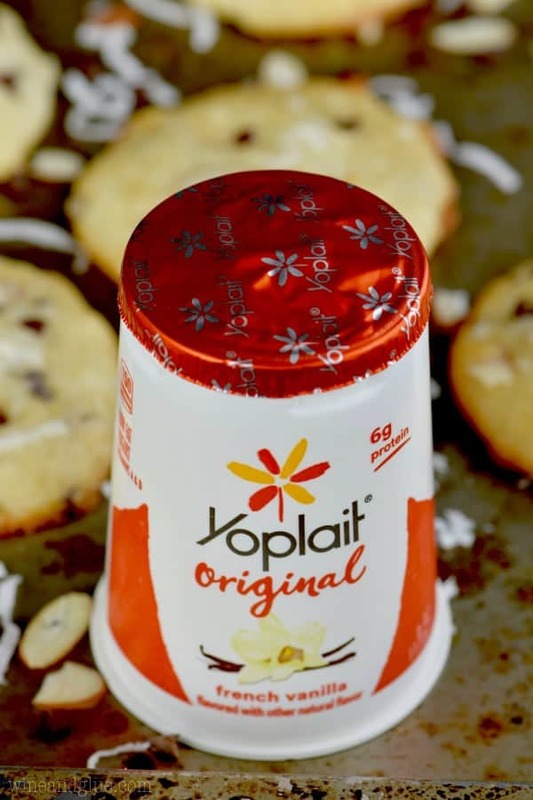 These cookies are made with Yoplait Original instead of butter. 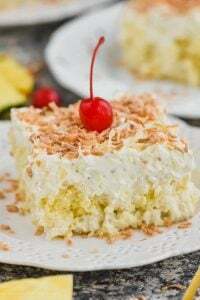 It makes them soft and cake like, with a little bit of chewiness. They are amazing right out of the oven! 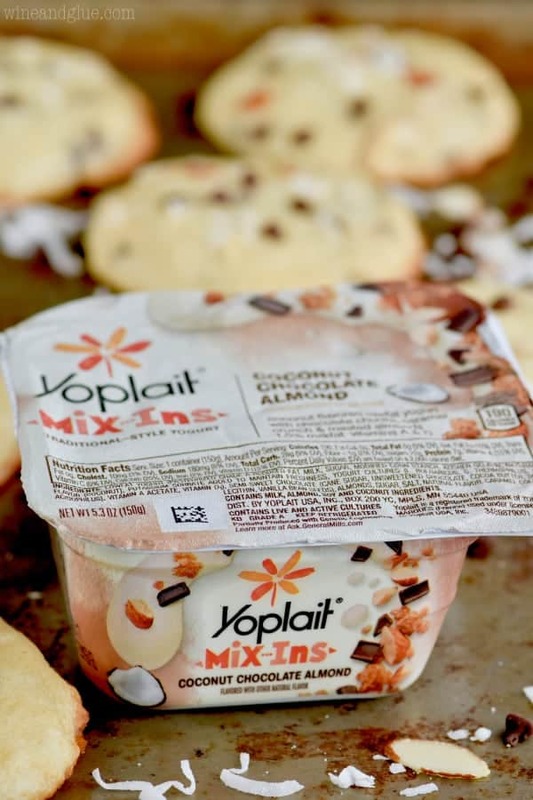 For more great snacking ideas using Yoplait make sure to check out these Make Ahead Freezer Smoothie Packs, this Coconut Chocolate Caramel Cookie Dip, and these Zucchini Muffins. 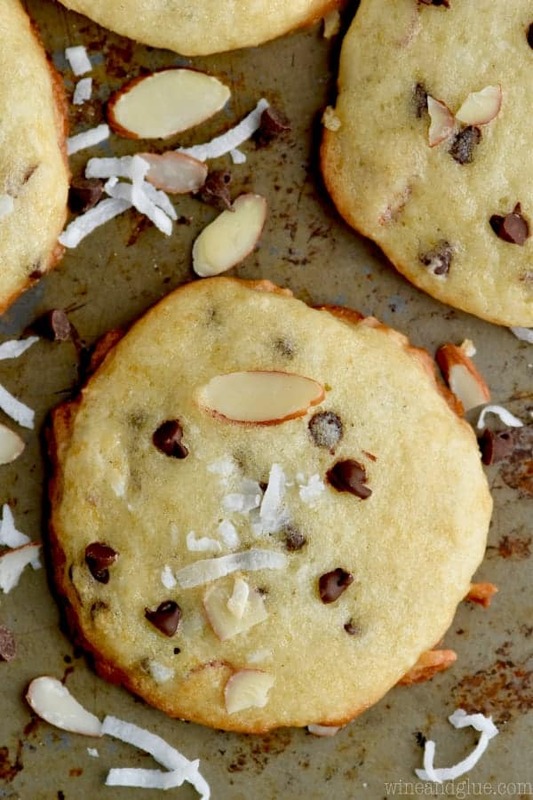 WATCH ME MAKE THESE CHOCOLATE ALMOND COCONUT YOGURT COOKIES! 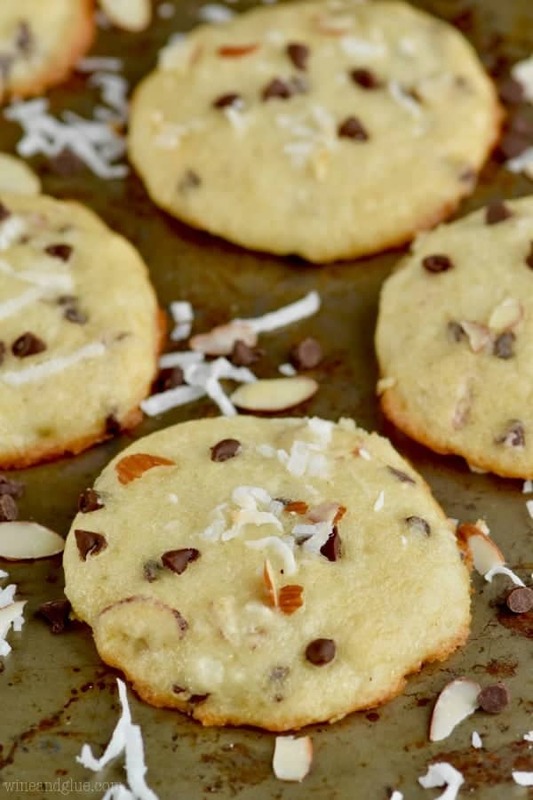 These Chocolate Almond Coconut Yogurt Cookies are chewy, delicious, and the perfect flavor! These cookies are made with vanilla yogurt, but you could use this recipe as just a starting off point. Preheat your oven to 375 degrees. Line two baking sheet with a silicon mats or parchment paper and spray lightly with cooking spray. In a large mixing bowl combine the flour, baking powder, baking soda, and salt. Whisk together and set aside. In another mixing bowl whisk together the sugar, yogurt, egg, and vanilla. Combine the wet and dry ingredients stirring until just combined. Stir in the chocolate chips, almond slices, and coconut shreds. Using a small cookie scoop, drop about 1 1/2 TBSPs of the dough on the prepared baking sheet approximately two inches apart. Bake for 10 to 12 minutes, rotating once during baking, until the edges begin to lightly brown. Store in an airtight container for 2 to 3 days and these are enjoyed most either fresh from the oven or warmed up in the oven for a few minutes before serving. Recipe just barely adapted from Spoon Fork Bacon. Hey at least you go to these activities and you have 3 kids! Making an appearance counts 🙂 Even if you are scheduling FB. Been there…but with urgent brand rep emails LOL. These cookies…I love the idea! LOL! I know you totally get it Averie! And the flavor in these cookies is AMAZING! 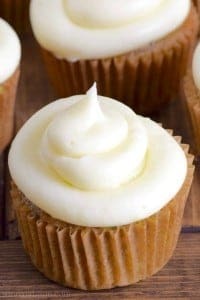 These look so soft and yummy. 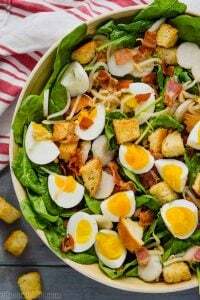 Love the little tang that yogurt would add to these! I love soft cookies so I’m super into this idea! Thank you so much! They were so soft and delicious!